Trump has to renew/not renew the Iran agreement every 120 days. It’s true that back in January 2018 he said the next renewal date would be decisive. But Trump has not been very punctual about his own deadlines. So why is Netanyahu investing so much in this particular deadline? I am averse to conspiracy theories but I can’t resist this thought: The next deadline is May 12. 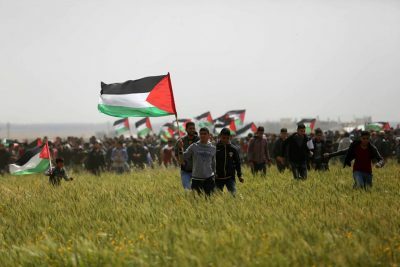 The Great March of Return climaxes on May 15. If Trump pulls out of the agreement on May 12, the media will be riveted on the fate of the Iran agreement. It’s the perfect moment for Netanyahu to commit a large-scale massacre when Gazans attempt to breach the fence. Netanyahu (and Israeli leaders generally) are finely attuned to the US news cycle, so this must be considered a real possibility. Recall, e.g., that Netanyahu launched the ground invasion phase of Protective Edge the night of the same day that the Malaysian airliner was shot down over the Ukraine, when all the news cameras turned away from Gaza and towards the Ukraine. Already as far back as 1989 during the First Intifada, Netanyahu criticized the Israeli government for not carrying out a large-scale expulsion of Palestinians while cameras shifted to the China’s Tienanmen Square massacre. The other possibility is, Netanyahu will carry out a large-scale atrocity or assassination of Hamas/Islamic Jihadi leaders on May 12 in order to provoke a “rocket” attack from Gaza, which will provide Israeli with a pretext to attack Gaza preempting the May 15 march. In 2008, Israel waited until November 4, the day of the historic election carrying Obama into power, to launch the commando raid into Gaza that broke the ceasefire. No one noticed the commando raid because all the cameras were focused on Obama. When the ceasefire broke down after the murderous Israeli provocation, Hamas was blamed. Read this article by Al Jazeera: Six killed by Gaza Strip blast: Palestinian Ministry of Health.